The historical origins of the chocolate covered raisin and chocolate covered peanuts are unknown. However, most early references tend to originate from the Germanic-speaking regions of Europe. A popular folk tale mentions “kleine Schokokugeln” (little chocolate balls). Raisinets are the number one largest selling candy in United States history. Raisinets were introduced in the United States in 1927 and Goobers were introduced in 1925 by the Blumenthal Chocolate Company. Nestlé acquired both brands in 1984. A large number of other brands also exist. Raisinetes and Goobers are, of course, right up there with popcorn as the thing to eat at the movies. The Blumenthal family had originated in North Carolina, and Goober, a southern word for peanut made it a natural name for the milk chocolate-covered peanuts they began to make. 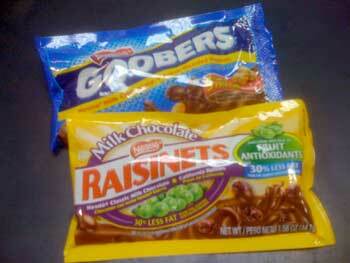 Raisinets and Goobers are the earliest and one of the most popular brands of the product, currently made by Nestle.